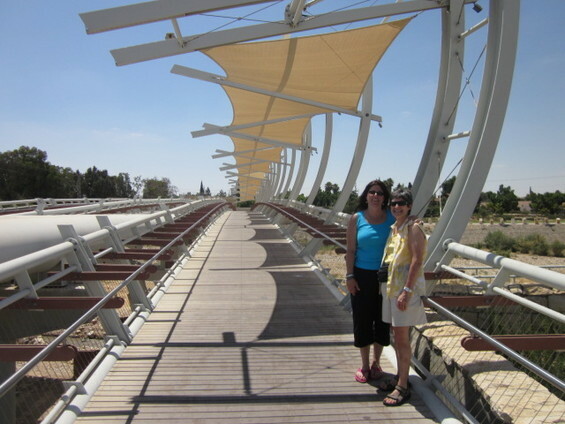 Jewish National Fund (JNF) Executive Board and Sapphire Society member Judith Sydney(L) and her wife Aviva Sapers(R) visited the Pipes Bridge, a pedestrian bridge that connects JNF’s Be’er Sheva River Park to the Old City of Be’er Sheva, and is the centerpiece of the city’s green, vibrant, modern transformation. The innovative design for the bridge incorporates existing water pipes at the site instead of concealing them. The innovative design for the bridge, chosen in a 2008 architectural competition, incorporates existing water pipes at the site instead of concealing them. Benches and a covered shaded area enable pedestrians to leisurely stroll along the walkway, and an observation point at the center of the bridge, called “The Balcony of the Negev,” affords a magnificent view of the Old City, the Be’er Sheva River Park, and Abraham’s Well.